The way to convert IFO to MP4 can be pretty easy, if with a DVD ripper installed. But the result can be varied, if an improper DVD ripper is chosen. Notice: You shall bear in mind IFO files store control and playback information, covering chapters, subtitles and audio tracks. Video or audio data or subtitles are stored and mulitplexed in the VOB container format but not IFO, both of which, along with BUP, are contained in a DVD folder, aka Video_TS folder. So when we refer to convert IFO to MP4, it generally means the conversion from Video_TS to MP4. MacX DVD Ripper Pro - Rip DVD, ISO image and DVD Folder with IFO file to MP4, MOV, MKV, AVI, WMV, etc with high quality. Support Intel QSV and Nvidia NVENC hardware encoding tech to greatly accelerate the conversion. Q: Why Error Messages Pop up during IFO to MP4 Conversion? A: Almost all commercial DVD-video titles use copy protection method, intended to prevent against piracy, which also affects the IFO and VOB files. These measures are also called anti-ripping techs meant to foil general DVD ripper software, among which CSS is widely encoded on DVD discs. Consequently, many so-called free DVD ripper like Handbrake will malfunction with an error of "No valid source found", if CSS-decrypting program like libdvdcss, DVD Decrypter or so is uninstalled. Macrovision RipGuard, region codes, UOPs, Sony ARccOS and X-Project are also known for discouraging programs from copying the discs. So for a successful DVD IFO to MP4 ripping, a DVD decrypter or DVD ripper built in DVD decrypting feature is a must have to rip protected DVD. Q: The Conversion from IFO to MP4 Format Is Lengthy, Any Fast DVD Ripper Recommended? A: You shall make it clear that slow process mainly depends on the max speed of DVD drive. Outdated computer CPU and RAM memory also slow down the ripping. On the flip side, the DVD ripper also has great impact on the converting speed. If the former two factors are foregone conclusions, then the program itself dominates. Feedbacks from users indicate an IFO to MP4 converter supporting hardware encoding technology or equipped with conversion speedup kernel is much more faster than ordinary DVD rippers. So it wise to take these decisive factors into consideration, if a fast DVD ripper matters. Q: Should I Convert IFO to MP4 H.264 or to MP4 MPEG4? 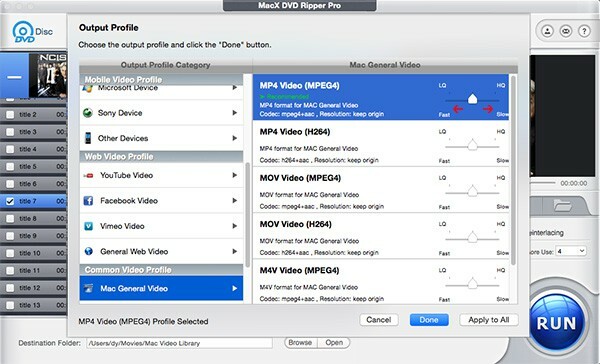 Among the massive IFO to MP4 converter software, the professional MacX DVD Ripper Pro arrives to tackle all the mentioned problems. With 10 years of DVD ripping experiment, the DVD ripper makes the conversion an easy task just in a few minutes only. The DVD copy protections, be it CSS, Region Codes, Sony ARccOS, UOPs, or X-project DRM won't be any thorny obstacle for this program, thanks to its built-in DVD analysis engine and title-check mechanism. It supports all types of DVD-video, be it DVD disc, ISO image or Video_TS folder, and rip both homemade and copy protected DVDs or IFO files to MP4 (h.264/MPEG4), MOV, MKV, AVI, WMV, etc effortlessly. Lightning fast speed is what the IFO to MP4 converter proud of. By utilizing the world's advanced hardware encoding technology (Intel QSV, Nvidia NVENC), multi-core CPU and Hyper-threading technology, it successfully outputs MP4 videos from IFO Video_TS folder within a few minutes, 5X faster than competitors in our test. Prior to the DVD IFO to MP4 conversion, please download the program on respective Mac or Windows computer, even compatible with macOS high sierra and Windows 10. 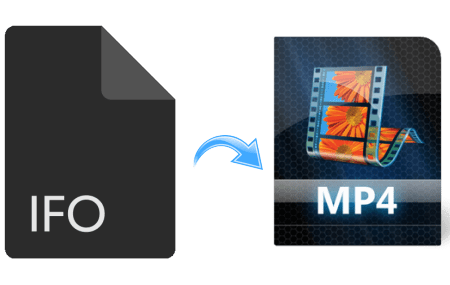 Run MacX IFO to MP4 converter and click DVD Disc button, after which a window pops up, where you can choose to convert DVD Folder containing IFO files to MP4 format. Choose the DVD Folder and click OK. It will automatically scan the right title from the fake ones without any third-party DVD Decrypter. When the output profile window pops up, go to Mac or PC General Video > choose MP4 H.264 or MP4 MPEG 4 as per your needs. For high quality and better compatibility, we recommend you to choose MP4 video with codec H.264+aac as the output format. Click Browse button to save the output file and click RUN to begin the transcoding from DVD IFO file to MP4 format. What is IFO: IFO (information) files contain all the information a DVD player needs to know about a DVD. Startup-scenes, chapters, time to a movie stored on a DVD, audio tracks location, and subtitles information are included in the files. What is MP4: MPEG-4 Part 14, aka MP4, is a digital multimedia container format that stores video, audio, subtitles, still images, etc. MP4 is known for its high compression ratio, lower bandwidth consumption, and the widest compatibility with mobile phones, tablets, media players, tvs, game consoles, computers, etc and is the industry standard for a long time. Best IFO to MP4 converter - MacX DVD Ripper Pro enables you to freely rip DVD, ISO image, DVD folder with IFO files to MP4, MOV, MKV, WMV, AVI, FLV, etc with high quality and fast speed and flawlessly get rip of any DVD copy protection measures without third-party software.